By some estimates, 74% of Indian homes have at least one member who is an addict. 10 people commit suicide in India each day due to drug abuse. These aren’t just numbers but scores of family lives, careers and relationships ruined. The steadily worsening problem of drug abuse among Indian youth has long called for collective action. As a response to this need, a nationwide campaign Drug Free India, an initiative of The Art of Living, will be launched on 18th February at Chandigarh University and at Guru Jambeshwar University of Science and Technology, Hisar, Haryana with the support of Government of Haryana on 19th February in the presence of Gurudev Sri Sri Ravi Shankar, who will be joined by popular Bollywood actor, Sanjay Dutt. 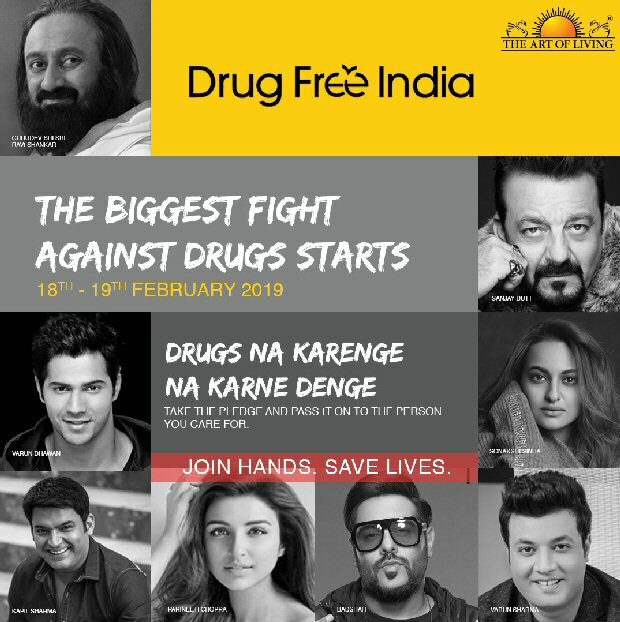 Other Bollywood celebrities including Varun Dhawan, Sonakshi Sinha, Parineeti Chopra, Kapil Sharma, and Badshah (find the quotes below) have also lent their support to Drug Free India, an integrated campaign with a 360 degree focus on combating the drug menace. An estimated 60 thousand students will attend the event on both the days. Thousands of colleges across the country will join via live broadcast and millions will take the pledge against drug abuse simultaneously. The Art of Living has mobilized thousands of its volunteers for this initiative, who are working round-the-clock to create SWAT (Social Wellness and Awareness Training) clubs across college campuses in the country. These clubs will comprise of students, teachers, doctors and social workers who will spread the word against drug abuse throughout the year. Over the last few decades, the Art of Living has used a multipronged approach in addressing the ubiquitous problem by raising awareness through sensitization workshops in schools and colleges in India, organizing awareness drives and running integrated rural development and de-addiction programs. Besides Varun, Sonakshi and Sanjay Dutt other actors like Shilpa Shetty Kundra, Uri star Vicky Kaushal, Tiger Shroff, Arjun Kapoor, Ayushmann Khurrana, Bhumi Pednekar, Bhushan Kumar, and a host of others. I sincerely support this most needed initiative taken by @SriSri for a #DrugFreeIndia. I sincerely support this initiative taken by @srisri for a #drugfreeindia. I sincerely support the initiative taken by @SriSri for a #DrugFreeIndia. SCOOP: Ranveer Singh roped in for Meghna Gulzar's Field Marshal Sam Manekshaw biopic? Previous Bahubali star Anushka Shetty is winning hearts in white and this is the reason!